Barking dogs may annoy neighbors trying to get to sleep but barking is the only way that dogs can communicate. This communication is between other dogs and their human masters. Before you can deal with barking dogs you have to understand the canine behavior behind it all. I used to pose a question to clients from time to time. I asked them which is worse a barking dog or a crying baby. People often picked a barking dog because a baby can be picked up and rocked and often quieted. After going through the 21 question game of figuring out why a baby is crying young parents eventually figure it out. Since all dogs bark, except the Basenji, it is impossible to stop it completely. A dog can be conditioned to bark only when appropriate. People have to be able to interpret the signs of distress, fear and hunger that a dog is trying to communicate via barking. Happiness- Going for a walk with an owner is one of the most pleasurable things a dog can think of doing. All you have to do is pick up the leash and the dog barks and cries out; jumping up and down at the same time. Barking dogs elicit pleasure and happiness by a different type or tone of bark. Territorial- Barking dogs that are in some sort of enclosure be it a car or a fenced in yard will become territorial and protective of their property and human family. This type of bark is usually a high pitched, shrill one. It is accompanied by growling and a showing of its upper incisors and canine teeth. Its body language is saying stay away from here! It is a warning shot. Sort of like a shot over the bow of a ship. Pain- Dogs in pain may cry out but also bark at the same time. The crying out is intense pain. Many people think dogs and cats don’t feel pain the same as people do. That is wrong as I had to correct a myriad of people and tell them that dogs and cats feel pain exactly as we do. If an animal is injured away from humans it will bark as a sign to come look for me, I am hurt! It is the same as an injured person crying out in pain yet calling for help. Those words- “help me” are akin to barking dogs under those exact situations. Fear- Dogs that are scared or fearful will bark with the an anxious look on their faces. 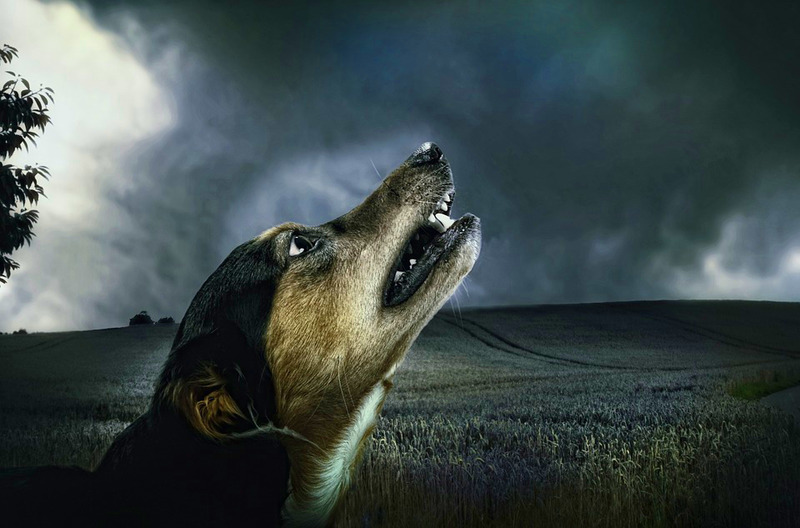 Many dogs are scared of thunder and lightning storms. They can anticipate a storm way before people can. This fear is accompanied by barking and crying out. The response is to hide under the owner’s bed or head straight to the basement. Kept outdoors- This is the type of barking that most people feel the most annoying; particularly barking dogs at night. A dog that is kept outdoors by itself for hours or all day and night is going to bark. Dogs that are not provided shelter, food, water or shade from a hot summer day are going to constantly bark. THIS IS NOT THE DOG’S FAULT! The blame squarely resides with the owners. Dogs are social animals and do not do well by themselves. They need and require human or dog companionship. Like humans, they are pack animals and gregarious by nature. Being kept outdoors day and night or chained up is bad human behavior. Most people in these circumstances should own a stuffed animal rather than a living thing. Insufficient Exercise- Certain breeds of dogs such as all the retrievers, Boxers and others require a tremendous amount of exercise. Having once been a little boy of 7 years of age I can fully understand. Little boys are full of energy. It is just something that boys are hard wired with. That pent up energy has to be released somehow. If not, fights will break out and so on. The same goes with large breeds of dogs. If they need exercise or to “blow off steam” they will bark to get the owner’s attention. If they do not get needed exercise they too will rebel. Dogs will destroy drywall or anything in the home to get the owner’s attention. Alert others- Barking dogs are sort of like a way of transmitting morse code over a long distance. A message goes to one receiver then the telegrapher transmits that same message down the line eventually reaching the intended recipient. Dogs do the same thing. Everyone has heard this. One barking dog in the neighborhood barks then another down the road does the same thing. That dog then “transmits” the intended barking tone down the road as a mechanism of transmitting any particular emotion to animals miles away! Very effective. Wild dogs such as coyotes and wolves exhibit this behavior. It too is hard wired into the domesticated dog. There are times that dogs do bark at inappropriate times. Dogs often bark when guests are at the front door. The doorbell rings and your ears ring for the next 2 days. Anyone that owns a Poodle or Miniature Schnauzer can attest to that. The dog perceives a ringing door bell as a threat to the household. It is even worse if it is a delivery person. Many dogs are fearful of any delivery person wearing any type of uniform. This is a threat to dogs because uniforms are worn to demonstrate authority over others. Dogs pick up on this very quickly. They then feel threatened and challenged. Some measures of stopping barking dogs are simple. If the dog is outside and barking, bring it inside. 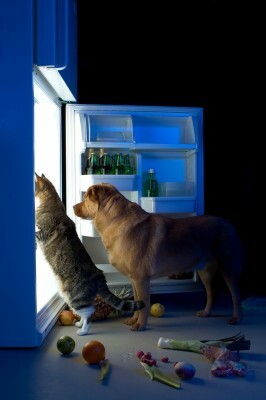 If the dog is hungry, feed the dog. If the dog is barking out in pain, take the animal to your local veterinarian. What about other barking situations that are not that easy to figure out? The first rule of thumb is NOT TO SHOUT BACK at the dog. Yelling to tell the dog to stop barking is going to make the dog bark louder and longer! It is NOW mimicking YOUR loud response! Speak in a quiet tone of voice to get the animal to understand that barking is not acceptable. Dogs are often more adept at first learning hand controls over verbal controls. Use conditioning behavior to stop barking with a particular hand command such as using your fingers brought together over your lips or a quick, horizontal movement of your hand. Reward the dog with a treat or take it for a well deserved walk. This walk will tire your dog a bit. That in itself will discourage further barking behavior. Separation anxiety or other fears such as initially being put in a dog crate can elicit barking behavior. Many times you can get rid of the stimulus that is causing the barking such as bringing a barking dog in your backyard inside the house. In that case you got rid of the stimulus causing the dog to bark. In the former cases do the training GRADUALLY. Leave the dog alone or in the crate for just a few minutes. If the animal doesn’t bark reward it! It will eventually learn that by staying quiet over an extended period of time it will get rewarded. Do not expect any of these measures to take effect overnight. These behavioral changes take multiple repetitions. It takes time plus ALL members of the family have to be on the same page. A lot of behavioral changes such as stopping dogs to bark are best done before the behavior get ingrained in the dog. The longer the dog barks in response to any stimulus or situation the longer it will take to alter that behavior. It is best to nip the undesired behavior in the bud and AT A YOUNG AGE. One of the best techniques is to TEACH your dog how to bark. This may sound counter intuitive but it is not. Use the word “speak”. Say the word and when the dog barks give it a yummy treat. Remember, this behavior takes times. Once the dog understands how to bark on command it is time to teach it to be “quiet”. It’s best to do this behavioral training in a tranquil home environment. Use the word “quiet” to get your dog to stop barking after you have issued the “speak” command. Reward the dog. In time you will be able to test the dog when the doorbell is rung. One final thought. I do not recommend the use of dog collars that elicit a shock to the animal when a button is pushed on a control box to change barking behavior. Using pain as a way to change behavior is not the way to do things. Never get your dog “debarked”. Many states have outlawed the procedure. This alters the anatomy of the dog’s larynx (voice box). Dogs can still bark but the sound is muffled. This procedure also has medical consequences. It can lead to laryngeal paralysis (particularly during surgery) and aspiration pneumonia. NEVER, EVER apply a dog muzzle or device that shuts the dog’s mouth! Panting is the only way a dog can eliminate excess body heat. By clamping the mouth shut with a muzzle your dog will suffer respiratory distress and or heat exhaustion/heat stroke. Thanks a lot for the comment Shirley. In 33 years of practice I have never worked on a Karelian Bear dog….That is a very good observation about dogs in a rural environment. Little dogs or any barking dog are a lot cheaper than an alarm system. Barking dogs get to be a problem when people live on top of one another. You are not strange at all, just a lot of common sense! If you like the site please spread the word.